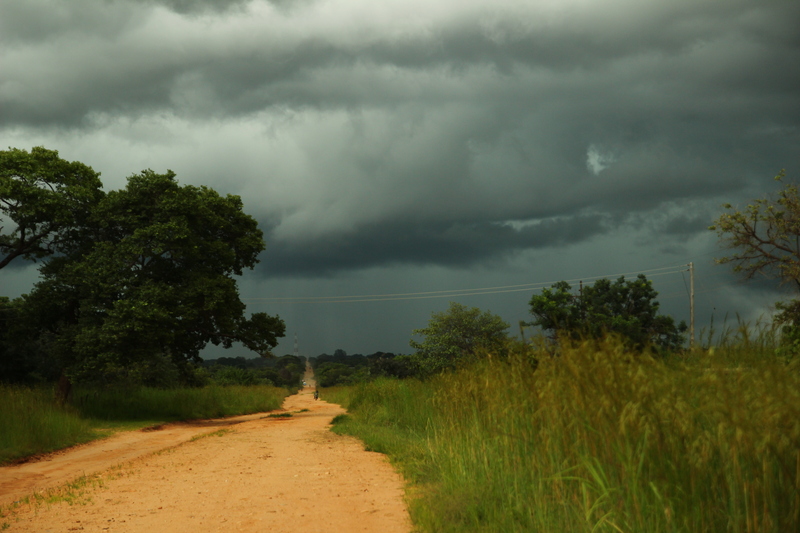 How to describe the feeling one can have with an approaching storm when stranded next to the road somewhere in rural Africa? How to bring the message over how it is to accept facts that used to be unknown? How to describe standing on the road, looking to the horizon seeing clouds coming in? Slowly but surely they are coming. The colors are changing, the sun gets covered, the bright light dims, and darkness suddenly is there. The wind starts blowing, fresh and you know things will be bad. The birds once singing their tune keep silence; there aren’t even flies buzzing around your ears. Yes, this rain, you see it coming from the distance. This rain is a part of the story I’m about to tell. After successful meeting sessions with our volunteers and the staff at the project they were working, and orphanage called Children’s Town in Zambia, I also met with Koko. Koko is a Japanese volunteer and both were up for a talk. Wading through a flooded Children’s Town we came in my “house”. It was a simple room, a roof of straw and low mud walls – you have to bend to get through the door under the roof. The “windows” were covered with bed sheets to give some more privacy. It was an empty house next to similar ones where teachers live. My room was furnished with only a mattress and a bed net. We sat down on the mattress and started talking. At some point the other girls passed by and left again. We got so much in the moment so we didn’t notice the time, the bell for food or even that it already became dark. Focussing on the content of the talks, talking as friends, informally, somewhere under African skies, as if we didn’t see each other for a long time. Then it really became time to go and she invited me to come with her to eat dinner with the other volunteers. Children’s Town is quite big and it takes a while to get from one place to another, especially in the rainy season. Small flooded paths, high grass, houses, left, right but going straight. I was wondering how to get back but Koko had to take her laptop from the office which was next to my house – problem solved. This was the last evening before I had to go back to Lusaka to leave to the US again the day after. I really wanted to have the best of our time so I stayed a bit longer after dinner with the volunteers. From a distance lightning came closer and when the first drops started falling, the time for me to go back to my house had already passed. Koko guided us back but soon hell broke loose! That rain! So much! So hard! and with so much wind!! The umbrellas we had become quite soon useless – in 10 seconds we were wet, we couldn’t see anything and had to scream to each other to overcome the sound of the rain and thunder that came nearer and nearer. Struggling to see where we are we somehow found my place. “Did you eat?” sounded from one of the houses. The weather still was raging and we were totally soaked. “Your friend too?” the voice of one of the teachers asked as if it was a son shiny day. – “Yes!! He too!”, Koko said with big eyes that were occupied with the weather and not with food. I already found shelter standing under my roof half in the door opening. Koko didn’t have the intention to find shelter. “Daniel!, I have to go now!”, she screamed. – “But it is not safe to go now!”, I said worried. No way I could convince her to come inside. – “Okay okay… See you tomorrow.” and she left quickly around the corner in the heavy rain and wind. This was certainly an evening to remember and a great ending of the day. After taking a shower in the pouring rain, the rain became much less strong. It became quiet and I somehow felt alone but with a smile on my face. I thought back at the evening I arrived and the morning of the day that turned out to be so good. In that morning when we were together, before all the meetings, the conversation with Koko and the storm I tried to get my laptop working that broke the day before and I shared my travel to Children’s town story.